It was a fantastic experience working with Kudos. Specifically the CEO and Product Owner were very responsive in adapting the teams app culture to game development. The opportunity to work with passionate people, in an analytics atmosphere, merging Chinese and American culture was a defining experience. During the production phase of this game our team adapted our agile methodology to better benefit from game design. Specifically, game design goals were addressed, and design specs drafted, in sprints preceding art and engineering sprints. This was a great move and greatly clarified our production pipeline, making the whole company more efficient. 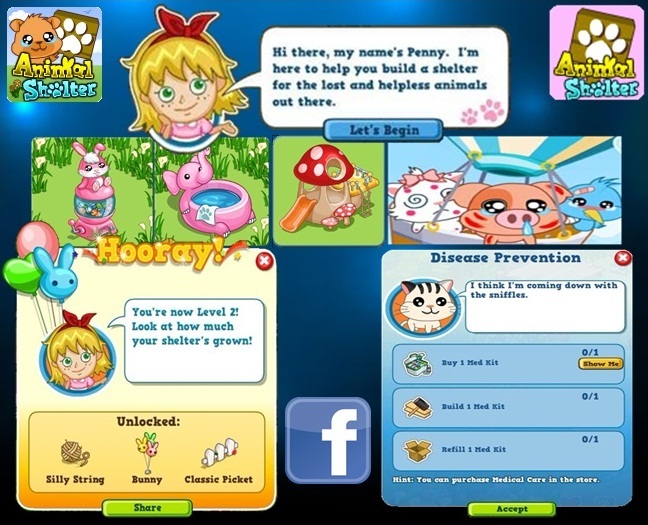 Animal Shelter was a FarmVille style social game. Players built their own animal shelter, upgraded their facilities, and saved animals. The animals were then nursed, nurtured, raised, eventually sent off for adoption. Worked directly with CEO and COO on vision document. System design for all game features. Ran alternating sprint meetings, with the PO.